“Our neighbor owns a restaurant where they serve some of the best Gyros this side of town. 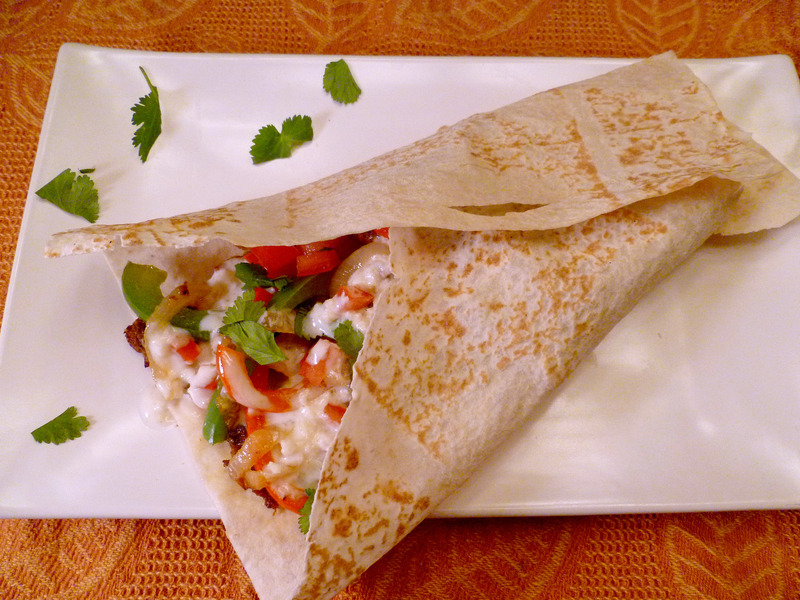 That of course means we have had our fair share of these warm and delicious wraps. I just love the flavors of the Gyro meat (typically lamb or shaved beef), yogurt sauce and fresh tomatoes all wrapped up in a soft pita. Of course, a gyro is not a gyro without the meat so I haven’t had the pleasure of indulging in one of these for quite some time . . . until now. I finally found the perfect vegan recipe that imitates this type of meat flavor almost perfectly. When my husband and I sat down at our kitchen island to try these we just looked across at each other, eyes wide, mouths full and we both knew what the other was thinking, “This is O.M.G. 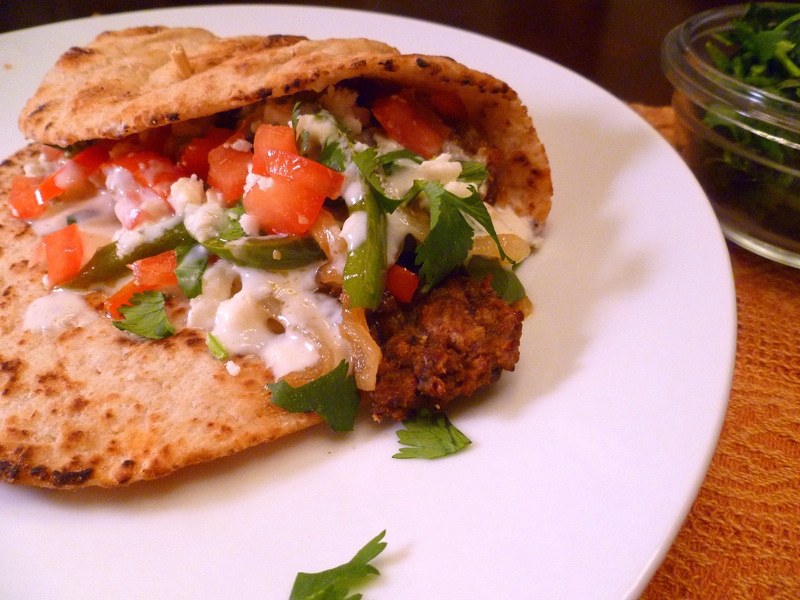 delicious!” As a flexitarian, this gives him the little meat kick he wants every now and then and for me it satisfies that craving I get for a warm and delicious gyro while being able to stick to my vegetarian diet. Yield: This makes about 6 pitas. I like to double the meatball recipe and then refrigerate or freeze extras for another meal that week. Spray a large cookie sheet or casserole dish with non-stick cooking spray and set aside for meatballs. Shape the mixture into 3/4-1 inch balls and place on the cookie sheet or casserole dish. If you want to make your “meat” into long rectangular style gyro “meat” (as in the photo below) then shape it into size (about 1 inch wide, 4 inches long, 1/4 inch thick) on the cookie sheet. 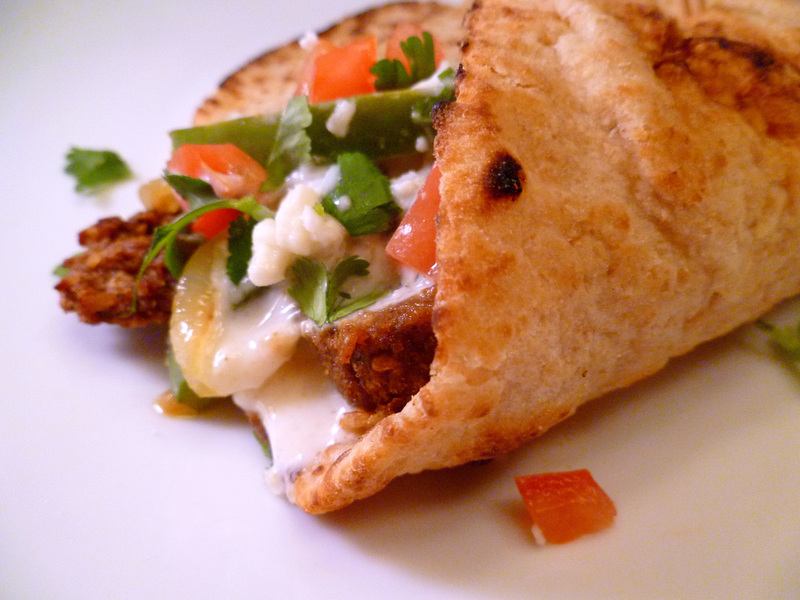 If you are using meatball shapes, you can cut them in half when you put them on the pita. Place in oven for about 8-10 minutes, turn, spray lightly with cooking spray (optional but it will help it get a browned effect) then cook another 3-4 minutes or until warmed through and browned. Whisk all ingredients together. Taste for salt and add as needed. This is super simple and you can add more lemon or cumin to your taste as well. Heat 1-2 tbsp olive oil in a skillet over medium heat. 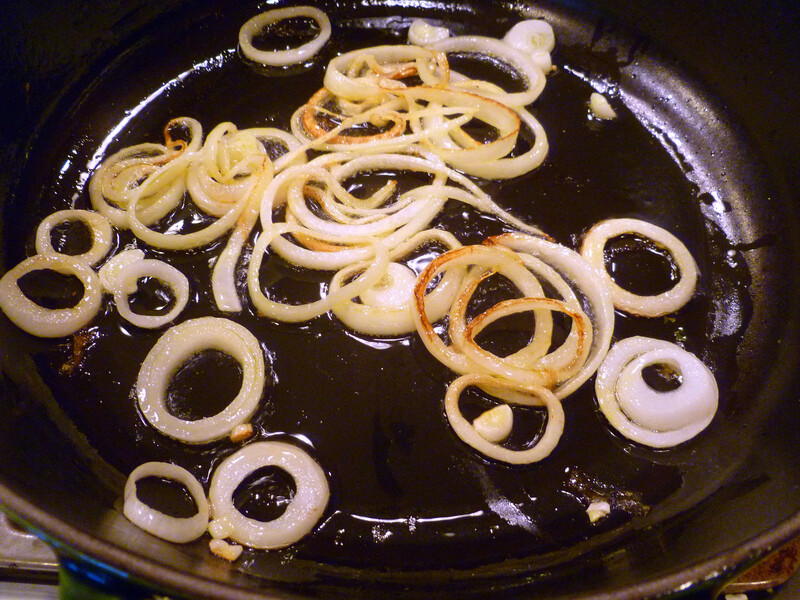 Add onion and saute to until tender and browned (see photo). Add in peppers and garlic and saute until peppers are crisp tender. Immediately remove from heat. Seed and dice a tomato and set aside. Make the meatballs and when they are in the oven, quickly prep the yogurt sauce and set aside. Saute the veggies according to instructions above. Meanwhile, when meatballs come out of the oven, brush a little olive oil on the pitas/naan and toss in them into the oven for a few minutes to get warm and pliable. Remove from oven. 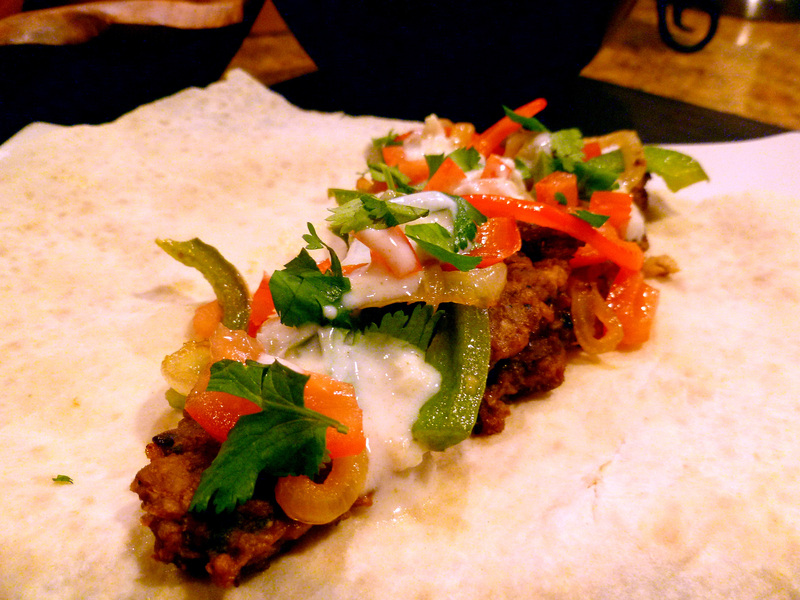 When meatballs are out of the oven, pitas are warmed and veggies are sauteed take your pitas and divide equal amounts in each of the “meat” and sauteed veggies. Sprinkle on some of the diced tomatoes then drizzle with yogurt sauce and top with cilantro and feta (if not vegan). If your meatballs are too dry, cook for less time or cook loosely covered with foil. You can use other veggies as well. Fresh diced cucumber also tastes delicious tossed into this wrap. If you are using thin tortillas, you do not want to put them in the oven or they will turn crispy, making it impossible to wrap them. You can warm them for a few seconds in the microwave if necessary. 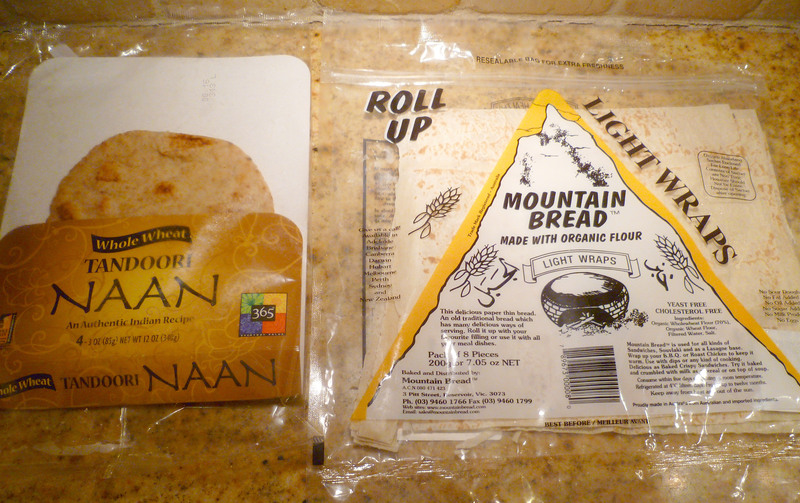 Various pita or wraps that you can use. 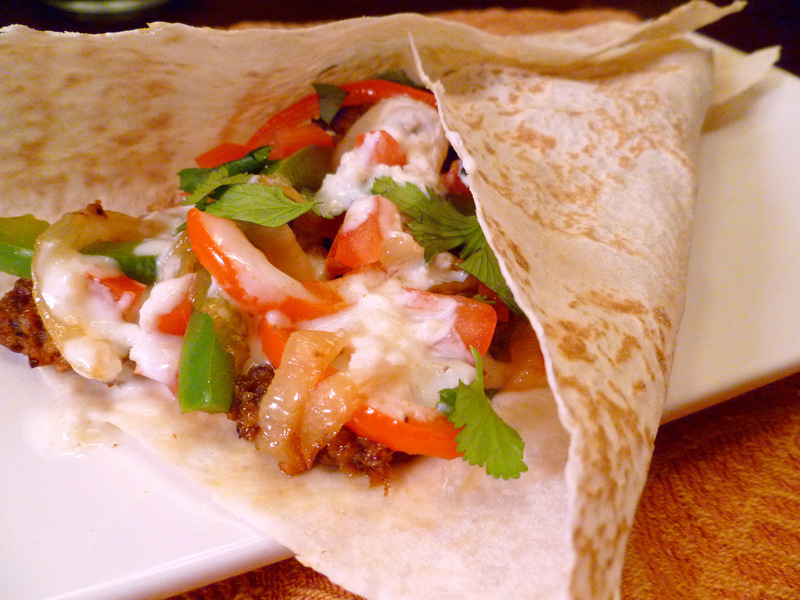 The light wraps save on calories but a true gyro is served on a thick pita or naan. Fold up the wrap and enjoy!